The 2018 DII football season is days away from opening kickoff. While the AFCA Top 25 shed some light on the power teams for the coming season, there are plenty of players looking to leave their stamp on the 2018 season. Last year, records were broken and highlight reel plays became the norm on a weekly basis. These 17 offensive weapons could be doing more of the same in 2018. Bolles, a 2017 Harlan Hill finalist, is the returning leader in passing yards from last year when he threw for 3,766 passing yards. To make it more difficult on opposing defenses, Bolles set a Mules record for rushing yards by a quarterback with 556. With both his leading rushers back to help alleviate the pressure and his receiving leader in touchdowns, Kyrion Parker, back in Warrensburg, Missouri, Bolles should be put on watch as the best quarterback DII has to offer in 2018. What did Hall do in 2017 to get his name on this list? The better question is what didn’t he do? Hall was fifth in DII with 3,519 yards passing. He was second in passing touchdowns, throwing a remarkable 41 to only four interceptions. For good measure, he added eight more touchdowns on the ground behind 547 yards rushing. There is quite a bit of youth on his offensive line, but Hall is crafty enough to handle the pressure. Satterwhite led the Tigers to the first seed in Super Region Two behind a 10-3 record. He became the school’s first Harlon Hill finalist by setting single-season records in several categories including yards (3,421) and completion percentage (.651). Qua Boyd will likely be his new favorite target with Donta Armstrong and Corey Davis lost to graduation, but with offensive tackle Brandon Anderson protecting him, Satterwhite should have plenty of chances to improve on last year’s numbers for the preseason No. 17 Tigers. With 99 and 80-yard kickoff return TDs in Saturday's playoff game, Assumption's Deonte Harris set NCAA DII career (12: 7 punt, 5 KO) and season (8: 5 punt, 3 KO) records for return TDs. Harris was arguably the most exciting player in DII football last season, and that’s an impressive statement with receivers like Slippery Rock’s Milly Raye getting ESPN air time. Harris was the Northeast-10’s Most Valuable Player behind a record-setting season, leading Assumption to the quarterfinals of the DII Football Championship. DII football’s all-time record holder with 12 return touchdowns (seven punt, five kickoff), he’s also quarterback Marc Monks favorite target. Harris can change the tide of a game all by himself, as he did against Findlay in the playoffs when he exploded for four touchdowns in the second half. 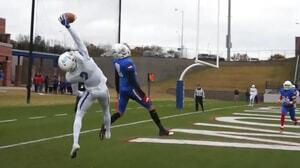 The First Team All-American was arguably the best wide receiver in DII football last season. He reeled in 1,458 yards at a 16.95 yards-per-catch rate to go along with 15 touchdowns. He will have a new quarterback throwing to him as Andrew Elffers is graduated, but he has the skills to excel with anyone under center. Oliver had 950 yards receiving and 12 touchdowns in 2017. Those are pretty good numbers, until you consider that it was a down year for the Orediggers All-American wide receiver. Oliver had a huge 2016, leading DII in yards (1,627) and touchdowns (26) before returning to more human numbers in 2017. With Ben Bottlinger under center for his second full-season, the two should be much more on the same page, and Oliver could have a senior year for the record books. As always, Mines will be neck-and-neck with CSU-Pueblo and Colorado Mesa for the Rocky Mountain Athletic Conference title, and a big season from Oliver would be a huge boost to those chances. There’s a new quarterback in Shepherdstown, West Virginia, but it’s a theme that Feiss is getting used to. In 2016, he reeled in 734 yards and two touchdowns from Jeff Ziemba. Last year, Feiss erupted with Connor Jessop under center, catching nine touchdowns and 1,391 yards, even throwing a touchdown pass to Jessop during the season. This year, he will have yet another signal caller, but with senior Wanya Allen opposite of him forming as scary a wide receiver duo as any in the country, it should be just another year for Feiss. Speaking of dangerous wide receiving duos, Adams State has one of the best. If there’s one thing the Grizzlies weren’t short on in 2017 it was firepower through the air. Senior quarterback Nick Rooney returns and will have his two favorite targets from last season. Hovasse had a monster season pulling in 1,201 yards receiving and 14 touchdowns while his counterpart Surrell was equally dangerous with 954 yards and 10 touchdowns. If Adams State wants to be the surprise team of 2018 in a stacked RMAC, it starts with them. For some running backs, 449 total yards and five touchdowns is a nice season. For Jones, that was just another game. The Pennsylvania State Athletic Conference record-setting running back lit up Slippery Rock’s defense for 354 yards rushing, 95 yards receiving and five touchdowns. He broke 150 yards rushing in all but one game in leading DII football with 2,176 yards rushing and 29 rushing touchdowns. The PSAC West is one of the unfriendliest divisions in all of DII football, so if Gannon wants to have a chance, Jones is in for one amazing encore. What’s better than a monster, 1,000-yard running back? Two, obviously. The Mavericks and Crimson Hawks both had that pleasure last season. Gunn ran for 1,550 yards and 12 touchdowns and Taormina rushed for 1,140 yards and 11 touchdowns. The two combined to form the third-best rushing offense in DII football. There’s a reason that the Mavericks open 2018 in the No. 3 spot, and it’s Gunn and Taormina. Bullock and Evans ran the Crimson Hawks all the way to the No. 1 seed in Super Region One last year and IUP opens the season at No. 4. There are plenty of weapons returning, including exciting, versatile quarterback Lenny Williams, Jr., but the two-headed monster of Bullock and Evans is dangerous for the PSAC. Bullock led the way with 1,279 yards and 13 touchdowns, while Evans added on 1,011 yards and six touchdowns. Henderson State, the Tigers biggest rival that they face in the Battle of the Ravine in the season finale every year, had an NCAA record 31-game road winning streak snapped in 2017. That was because Drew Harris scored seven touchdowns, all seven touchdowns that Ouachita Baptist scored mind you, in a thrilling 49-42 victory. OBU won the Great American Conference and made the DII postseason. That was in large part to Harris and his 27-touchdown season. Now a top-25 team, Harris will have to be at his best for the Tigers to survive an always tough GAC schedule. The ThunderWolves defense is sick in 2018. Defensive back Darius Williams will lead a ridiculous secondary, but DL’s Deyon Sizer and Michael Wristen will make quarterbacks’ lives miserable up front with Brandon Payer and his linebacking gang preying on anyone they miss. That’s why Dennard’s 2018 season is so important. Dennard had a big 2017, leading the team in rushing (1,083) and touchdowns (17). If he can get it going for his senior season and help the ThunderWolves rule time of possession, the ThunderWolves could run away with the RMAC early. The freshman made his presence felt on Day 1 of the 2017 DII football season. McKellar broke off 206 yards on the ground as a then-unranked UIndy upset No. 2-ranked Grand Valley State in the season opener. The Greyhounds never relented, running the regular season table and making the DII postseason. McKellar had 1,146 yards rushing and 13 touchdowns as a freshman. The Greyhounds are no longer the underdogs and McKellar will be a big reason they stay atop the Great Lakes Valley Conference.